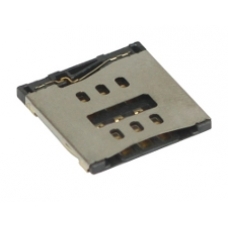 iPhone 5c SIM card contact reader allowing the iPhones 5c SIM card to be read and written to. If you have for any reason damaged this part, the iPhone 5c will not be able to read any information from the SIM card. You will need to replace this logic board level component. Please be aware this is a difficult home repair. The error message on the iPhone 5c will be No SIM even when the SIM card is inserted.